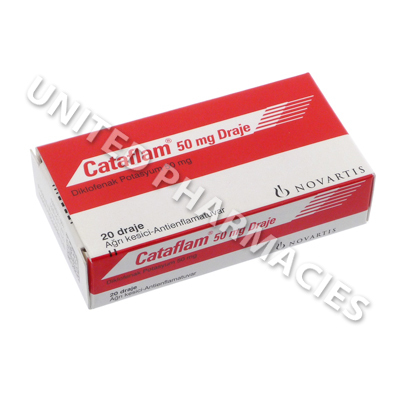 Cataflam (Diclofenac Potassium) is a non-steroidal anti inflammatory drug (often shortened to NSAID), which is used to provide relief from symptoms of arthritis, such as pain and swelling. 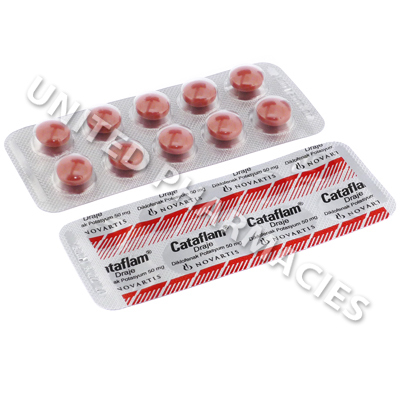 Cataflam (Diclofenac Potassium) is a non-steroidal anti inflammatory drug (often shortened to NSAID), which is used to provide relief from symptoms of arthritis, such as pain and swelling. Pain from acute gout, surgery, injury as well as back pain and acute disorders which affect the muscles (for example, tendonitis) are also treated with this drug. Its active ingredient works by preventing the body from producing chemicals called prostaglandins. These chemicals are responsible for symptoms such as swelling and pain. Various different dosage regimens may be prescribed to patients taking Cataflam (Diclofenac Potassium) tablets, and in each case, a medical assessment is necessary before the doctor can determine the proper dosage. Adults treating ankylosing spondylitis are sometimes directed to take 25mg by mouth, 4 times per day. The patient may be directed by their doctor to take an extra 25mg dose before bed. Other conditions may require different dosage regimens, and it is essential to check with your doctor before taking this medicine. Inform your doctor if there is any worsening of your condition or if you feel unwell. Severe reactions may be experienced by a small number of patients. You must immediately seek medical attention if you notice stiffness in the neck, light sensitivity, peeling or blistering of the skin, coughing up blood, weight gain or any other signs of a serious reaction. Non steroidal anti inflammatory drugs can sometimes cause intestinal bleeding or bleeding from the stomach. Ask your doctor about the risk of this before starting treatment. It is important to note that taking non steroidal anti inflammatory drugs (except for aspirin) can increase the risk of a heart attack or stroke when compared to patients who do not take these medications. Discuss all the possible risks of treatment with your doctor before starting treatment. Always use Cataflam (Diclofenac Potassium) as you have been prescribed by your doctor. Never self-medicate or change your dosage without first consulting your doctor. The correct dosage can vary depending on your health, medical history, and the severity of the condition being treated.